KUALA LUMPUR (July 11): Shares of AirAsia Bhd were actively traded on Bursa Malaysia today, after a report over the weekend said the low-cost airline is eyeing a dual listing in Hong Kong. At 2.35pm, AirAsia was up 6 sen or 2.32% at RM2.65, with 20.66 million shares traded, for a market capitalisation of RM7.37 billion. It was the fourth most actively traded counter on the local bourse. The stock earlier rose as much as 8 sen or 3.09% to RM2.67. In comparison, the FBM KLCI was up 0.52% at 1,653.17. 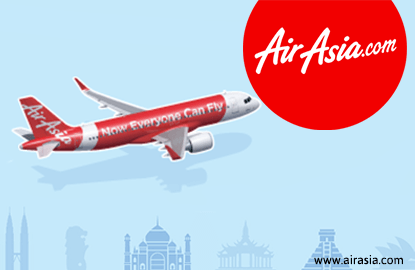 Quoting people familiar with the matter, Reuters reported that AirAsia is studying a dual listing in Hong Kong as part of its plan to become a pan-Asian low-cost airline player. The budget airline group is said to be talking to Chinese banks and potential shareholders as it also moves towards setting up a joint venture in China, according to the report.